Maybe it was the lighting that called to me! I have learned that adequate natural lighting is one of the most important factors in food photography & it isn’t always easy to get optimal light in my apartment. I typically cook in the evenings after work & yoga, & by the time I am finished the sun has long been down. Oftentimes, if the dish turns out well & looks pretty enough, I’ll photograph it the next day when the lighting is prime. I did take this photo last night, before the cooking process, so I could showcase the beautiful veggies that went into this ragout! This dish was inspired by a course that Chef Mickey Walker served at the Vegan Garden Dinner I attended a few weekends ago. 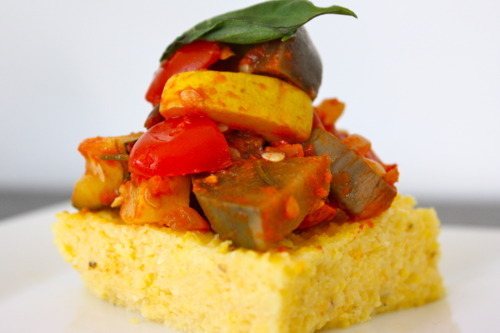 She made a ragout of eggplant & peppers & served it with seitan sausage over a polenta cake. It’s “clean out my fridge to make room for the new CSA share” week &, in addition, my friend Shelly returned from vacation & brought me more veggies from her over-grown garden! 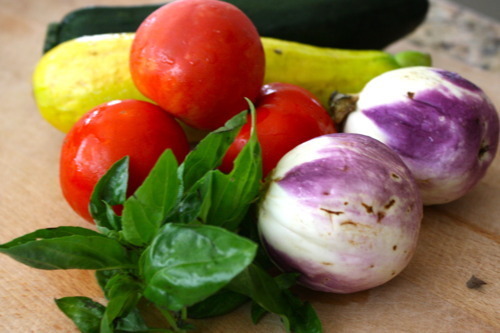 I had two beautiful rosa bianca eggplants & summer squash from Suzie’s Farm & some juicy tomatoes & herbs from Shelly. 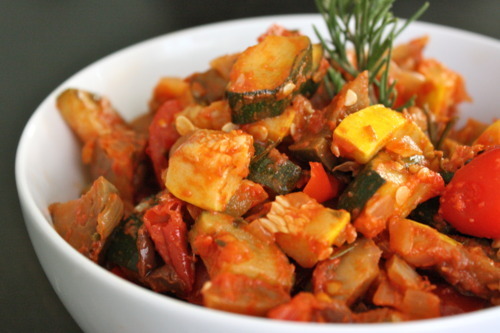 My first thought was to make a ratatouille, but I’ve been there done that enough this summer! I had some of Bob’s Red Mill Corn Grits on hand & I remembered the dish that Chef Mickey served, so I decided to recreate a version of that. 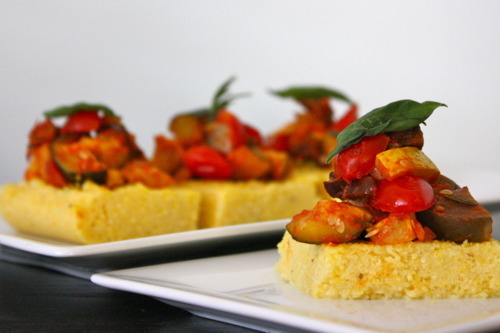 I began by making the polenta cakes, following this recipe, so they would have time to cool while I prepared the ragout. Bring vegetable broth to a slow simmer. Stir in cornmeal. Cook over low heat for 15 minutes, stirring frequently & scraping the bottom to avoid burning. Cornmeal is done cooking when it is smooth & thick. Stir in remaining ingredients before removing from heat. Press into a lightly greased loaf pan and chill until firm for a thick polenta loaf. For the ragout, I used this recipe from the Food Network as my guide & make modifications where necessary! Heat oil in a saute pan. 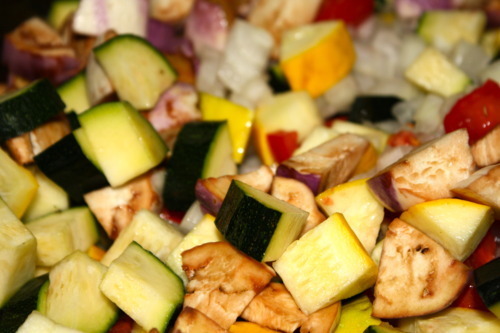 Saute onion, garlic, carrot, zucchini, yellow squash, & eggplant, until they begin to soften. Stir in tomato paste, chopped fresh parsley, thyme, and let cook until flavors integrate, about 10 more minutes. Add olives and heat through. Season with salt & pepper, as needed. Remove from heat and stir in fresh tomato. Let sit to rest. I expected this dish to turn out a bit differently. When I think of a ragout I think of a softer, “saucier” dish. Perhaps I should’ve cooked the veggies longer, or added more tomato paste? I also did not make the red pepper coulis that the recipe called for, so perhaps that played a part? Regardless of a texture miss, the fresh summery flavor was there! 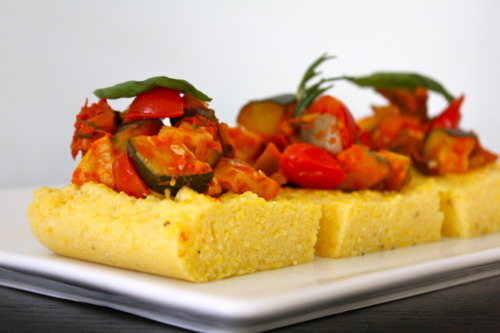 The veggies were sweet & tender & melted into the warm polenta cake. I also loved the addition of kalamata olives here. They add a nice element of surprise with their briny burst of piquancy! The polenta cake had a nice firm texture, while maintaining it’s creaminess. However, mine could’ve used more salt, & I’m not usually one to heavily salt my dishes. 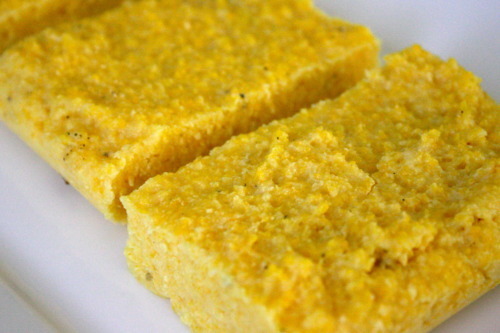 Typically polenta is made with Parmesan cheese, which gives it that salty, savory bite. The nutritional yeast did a nice job giving the polenta that savory flavor, but the saltiness was lacking, so salt it well & taste before letting the cakes cool & firm. I must say, so far this has been my favorite dish to photograph! The colors & textures were just gorgeous! I’ve been keeping a watchful eye on the photo stylings from some of my favorite blogs & taking mental notes. I had a lot of fun playing with angles & depth of field in some of these shots. I still have a long way to go, but I feel like I am headed in the right direction. My photos continue to improve & the camera confounds me less & less! Can’t wait for the photo workshop this weekend!